Alaska is a big place and no blog could sum it up. This is my slice of life living in Homer, Alaska. We had a fun weekend backpacking to the Lower Russian Lake this past weekend. We had 4 adults and 3 kids (8, 9 & 10 years old), 3 backpacking packs loaded, 3 smaller kids packs and 4 sleds loaded with 30 pieces of firewood, 10 gallons of water and supplies (only 2 on the way back!). There was very little snow up the road from where we were going to be hiking, so we were worried about being able to pull our sleds of stuff, but so many people had been on the trail that it was hard packed and didn't look like it would be melting anytime soon. 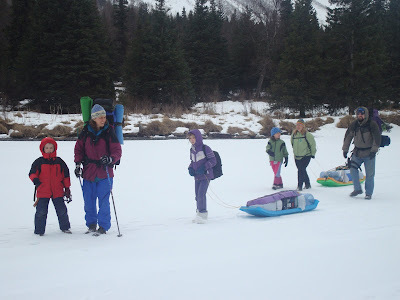 Yaktraks (rubber things you put on your boots when walking on ice/packed snow) helped us with traction as we pulled loaded sleds and carried the packs on our backs. It took 2 hours and 10 minutes to hike the 4+ miles (+ because we had to hike from the Sterling Highway since the road back wasn't plowed. The trail itself is 3.3 miles, so I would guess it was a little less than a mile back to the trailhead). We didn't get started till almost 7 pm, so thank goodness for a long dusk! We had to take the winter route because the summer trail is built into the side of the mountain and poses a very real threat of avalanches. 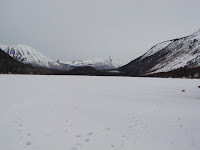 There were a couple areas by the lake where the trail had been wiped out by avalanches, so we were glad we took that route, though it was through a bog (very bumpy! ), cross country, with small streams to cross and no snow in some areas. When we got to the lake we discovered that we would have to cross the lake to get to the cabin. The ice was not frozen where we came to it because a stream entered, so we were not at all confident how deep the ice was. Once we got started we were more confident, which is good because it was a long mile to the cabin. The picture of the lake above is from the cabin; that is how far we had to hike the lake. We found a hole someone chopped in the ice; it was a foot deep. 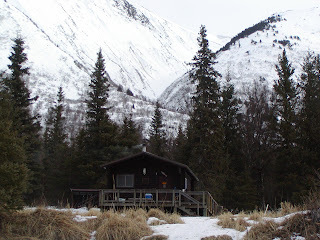 The cabin was rustic but well furnished with 2 double bunks and 2 single bunks, a a table with 3 benches, cupboards in the kitchen area and a flat-top woodstove that we could cook on (all for only $25/night! Seriously!). There was an outhouse that we all agreed was quite nice by outhouse standards (new seat, cleaning supplies, toilet paper and reading material!) and a woodshed that had 8 foot sections of dead trees we could cut up if we wanted. The cabin had 4 windows, 2 doors and a wrap-around deck, 2 saws, an ax, games, paper towels, a pocketknife and lots of miscellaneous stuff left by previous campers (I'm guessing). It seemed way more comfortable than I expected. The only wildlife we saw the whole weekend were a pair of large white birds (swans? geese?) that took off just as we reached Russian Lake. We saw a few moose tracks (very few) and signs of squirrels, but that was it. We had a .44 with us in case we had any problems with bear. We weren't sure if they were coming out of hibernation yet or not in that area, but figured if they were up and about they would be hungry, so we wanted to be on the safe side. From what everyone we've talked to says, it takes a minimum of a .44 to stop a bear. Smaller guns might slow them down, or make them mad, but not kill them. We all practiced some target shooting just in case. Our biggest problem the whole weekend was climate control. It was very difficult (actually, impossible) to get the temperature "just right" in the cabin, so we loaded the stove with wood and opened the windows. The good thing about staying in such a tiny place is that we didn't want to spend tons of time indoors, so we were out and about. Saturday we got out the toboggan sleds and ran races on the lake, took walks on the lake, the kids made forts, Denver chopped wood with his new hatchet, and Aurora and I climbed partway up the mountain across the lake and picked lowbush cranberries (yum, yum!) left over from last fall. We also read, slept, ate, talked and played games. The hike out took almost as long as hiking in, though it felt a lot faster as we weren't racing darkness and we knew where we were going. The sleds were lightly packed so we let the kids get on them for the downhill sections of trail and away they flew! A day and a half at this cabin seemed like as much of a vacation as a week in Michigan. It felt like a real get-away. We've got to do this more often! This afternoon a few minutes after the kids got home from school, we were standing around talking when suddenly Aurora said, "The house shook!" and Denver said, "I saw the house shaking!" I hadn't felt anything, but said, "That's an earthquake." The kids thought it was pretty cool, and I figured it must have been since they both noticed it. When Doug got home an hour later he said, "Did you feel the earthquake?" He'd been in Homer for a meeting when he saw everything moving and heard a low roar. At first he thought it was him, but then he realized it was a quake. Not ever having been in a quake of any magnitude before, I can only guess at the magnitude, but I my estimate would be somewhere between a 3.0-4.0. NOTE: We just heard on the radio that it was a 5.2, and the epicenter was Homer. The irony of it is that Aurora is building a seismograph for her science fair project, and she and Doug put it together yesterday. All that was left was to put on a couple parts and attach a motor. Aurora was very bummed it wasn't up and running; it would have been very cool to see if it actually worked! I was very curious to discover how I viewed Michigan differently after living in Alaska for 10 months. Upon landing in Michigan a week ago for a spring break trip and riding (not even driving!) down the road, I found myself scanning for moose. That didn't last long as it became obvious there were no moose around to potentially hit! My greatest impression of Michigan as I drove around the state for the past week visiting family and friends was "tameness." 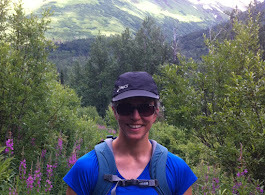 Part of what we enjoy about Alaska is the wildness and roughness. It has not been totally tamed and populated (yet), and while Alaska is not even close to as wild as it was 10, 20 or 30 years ago, it is still less modernized than Michigan. I found it very safe and comforting driving down roads in Michigan knowing that there were people everywhere and it wasn't far to the next gas station, store or town. Life just seemed softer and easier somehow. Everyone talks about how beautiful Alaska is, with craggy mountains, snowy glaciers, sparkling oceans and rushing rivers. However, Michigan has its own beauty. I went for a hike in the Pigeon River State Forest during my stay, and found that I appreciated the nuances and details of nature more on that hike. In Alaska there is a hugeness, an expansiveness and there are incredible vistas. It seems we're always looking off in the distance somewhere. I enjoyed being able to sit for an hour by a stream in Michigan and watch the sunlight play on the water. I also appreciated not having to worry about moose or bear. I would worry more about being attacked by a person in the woods in Michigan than a wild animal. I told my daughter the second day in Michigan "We could never move back, could we?" She agreed. For right now, Alaska fits us very well as we raise our kids. It is a giant playground of sorts, with more places to explore than we could reach in our lifetime. The air is clean, there is less traffic, and life seems less stressful. We eat better here (moose! ), the schools are good, and the icing on the cake is that we have relatives up here. I can see someday when our kids are raised and gone perhaps wanting the tameness, population and shopping opportunities found down yonder. But Alaska is home for us now, and we are so glad to be here. McNeil Canyon School comes up with some cool field trips. This one, for the day before spring break (today), takes the cake. 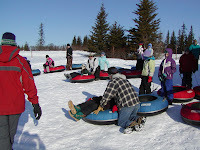 It is called Extreme Tubing and is about a 15-20 minute drive from Homer (up East Hill Road) and next door to the Ohlson Mountain downhill ski area. As you can see, kids hop on an innertube and fly down the hill at 30-35 miles per hour. To get greater thrills, the attendant gives them a hefty shove at the top or sends them spinning down the hill. The tow rope makes for a relaxing ride up the hill after the fast trip down. They have no water at this place, so it was pit toilets, but we should be happy to have any toilets, right??!! By the end of our two hours on the hill today and dozens of times down and up, everyone was wiped out and ready for spring break. It was sure an easy event to chaperone (though tiring!!) and the kids had a blast. There have been lots of changes in the area in the past few weeks as the days lengthen and temperatures warm up. While seeing bald eagles has been a regular occurance all winter, I see fewer now. The migrating birds have been coming in droves, and today when I was out on the Spit there was a crew filming and picking up the sounds of the birds as they rested on the ice breakup. Small planes are coming into the Homer Airport much more regularly now (2 and 4 seaters), filling the air with their horrendous sound pollution. The boatyard is hopping as crews get boats ready for the upcoming fishing season, and there are lots of boats being pulled down the road to be put in the water. Just as in Michigan, road crews are pushing back the snowbanks to keep the roads from getting flooded, but despite that roads are often flooded in places. Frost heaves are obvious as cars swerve into the oncoming lane to avoid them or brake to a crawl. And traffic is getting heavy...which by Homer standards means I actually have to stop and wait more than 10 seconds for a car to go by at corners in town. Like many places in the springtime, there's an excitement and energy in the air. People who have been grumpy all winter are smiling and cheery, and there is great anticipation for the upcoming season of light. If I stayed home and didn't go to town I wouldn't see as much sign of spring though, because up where we live there is still a few feet of snow and snowbanks over our heads. We get the best of both worlds: winter when we want it, or spring if we go to town. Locals say to expect snow until May 15 in Razdolna (the village where Doug's school is), though I suspect it will melt sooner here since we're at a slightly lower elevation. Thanks for visiting my blog. Enjoy!